Well this is a little creepy. 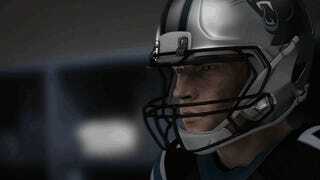 The GIF above is from the short teaser trailer for Madden 15. In it, Carolina Panthers player Luke Kuechly questions what he's becoming, like some sort of football Robert Oppenheimer and/or werewolf. He then proceeds to give the Magnum look from the movie Zoolander.